The apple machine is back! Hungry for a tasty, crisp apple? 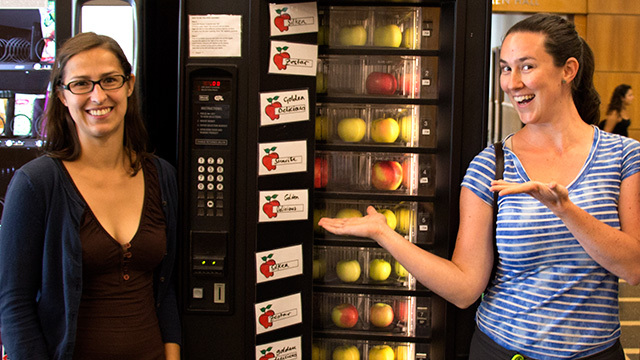 Satisfy that craving by visiting the apple vending machine just inside the front door of Mann Library. Graduate Field of Horticulture students pick the fruit from Cornell Orchards and the Horticulture Section’s Lansing Orchard and stock the machine. 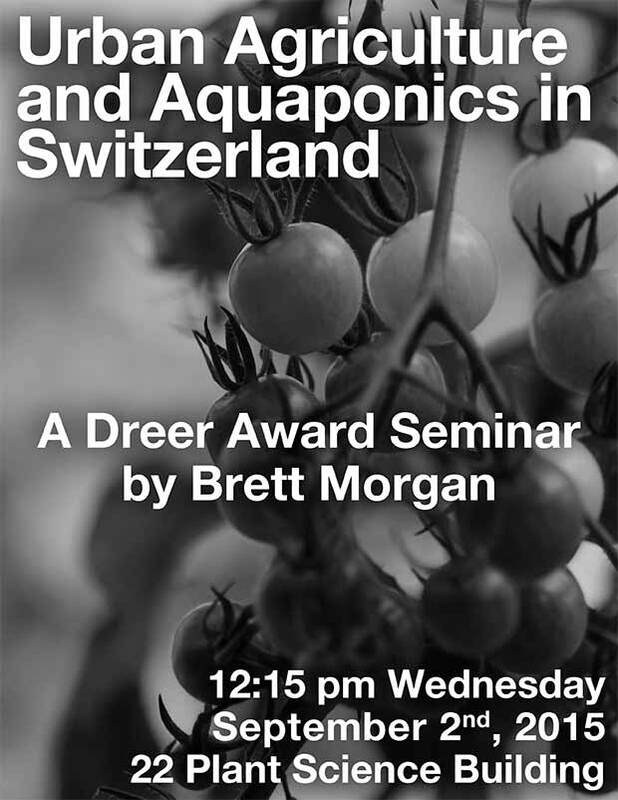 Proceeds support activities of Society for Horticulture Graduate Students (SoHo). The varieties available change through the harvest season. So stop back often. Horticulture graduate students Annika Huber and Juana Muñoz Ucros stocking the apple machine with varieties picked by grad students last weekend at Cornell Orchards. 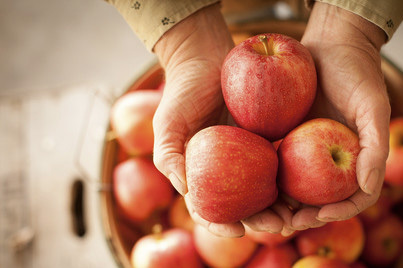 Cornell Orchards is open for the season! Cornell Orchards retail store will open for the season Friday August 28, and will be open next week Tuesday through Friday from 8:30 a.m. to 4 p.m.
Email me (orchards@cornell.edu) if you’d like to be added to our email list. (Every week or so I’ll let you know about available fruit varieties and store specials and what hours we’re open.) Or visit our website and/or follow us on Facebook to get the latest. Late Fall through Winter and early Spring is a great time for farmers to rest, slow down the frenetic pace (at least somewhat), and build new skills for the coming growing season. If you sign up for an online course through the Northeast Beginning Farmer Project, you don’t even need to leave your home to connect with other farmers, work on your farm plans, and gain practical tips. Are there courses for me? From aspiring to experienced farmers, there is a course for nearly everyone. If you’re just getting started exploring farming as a career, BF 101: Starting at Square One and BF 102: Markets and Profits, were designed with you in mind. For those with at least a few years of farm management experience, check out BF 204: QuickBooks for Farmers and BF 203: Holistic Financial Planning to take your skills to the next level. There’s a handy chart on our course homepage to direct you to the right courses for your experience level. These courses are part of the line-up of 16 online courses offered this Fall, Winter and Spring by the Cornell Small Farms Program. Learn which courses would be best for you, read about our team of experienced instructors, see answers to Frequently Asked Questions, and view the calendar of course offerings for 2015-2016. A summit meeting to identify resources and opportunities to improve agricultural resiliency to severe weather across New York state will explore current initiatives and link researchers and extension members. Cornell’s New York State Agricultural Experiment Station in Geneva, New York, will host the New York State Agricultural Resiliency Summit, Thursday, Sept. 10, 9 a.m. to 3 p.m. in Jordan Hall. The summit aims to increase individual and collective capacity to prepare for, respond to and recover from weather-related events. Participants will analyze the status of agricultural resiliency and emergency engagement and outline steps to improve how all stakeholders interact during a disaster. Breakout sessions will cover working with new weather patterns, improving communication before and after a severe weather event, and strategies to improve community preparedness. The event is free, but preregistration is required. 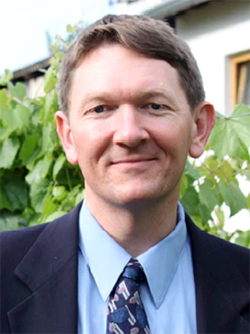 Direct questions about the summit to Trevor Partridge, 315-558–2815, tfp23@cornell.edu. The summit is funded by Empire State Development through a grant from the U.S. Department of Commerce, Economic Development Administration. 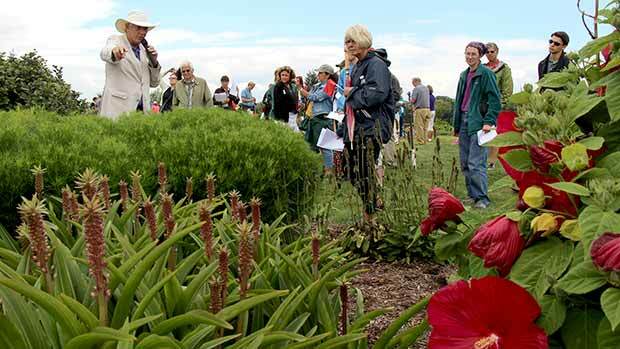 Alan Armitage, University of Georgia emeritus professor and best-selling author, points out overwintered pineapple lilies (Eucomis spp.) at Bluegrass Lane. 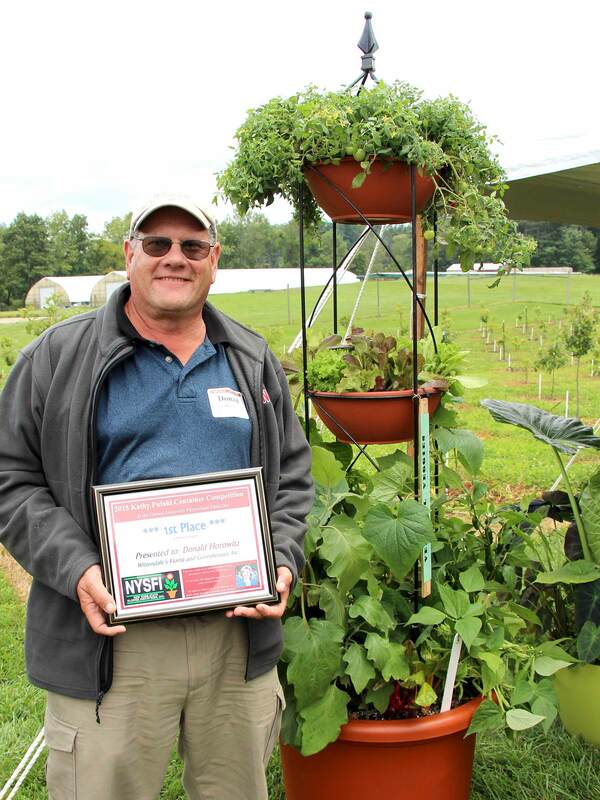 More than 120 greenhouse growers and retailers, florists, educators and others from around New York and the Northeast attended the annual Cornell Floriculture Field Day August 11. The day included morning presentations on campus followed by afternoon tours of flower trials at the Bluegrass Lane Turf and Landscape Research Facility and cutflower and high tunnel research at Maple Avenue. After a warm welcome from Kathryn Boor, Ronald P. Lynch Dean of the College of Agriculture and Life Sciences, attendees were treated by a talk on What’s trending in annuals, perennials and edibles by Alan Armitage, emeritus professor at the University of Georgia and best-selling author. 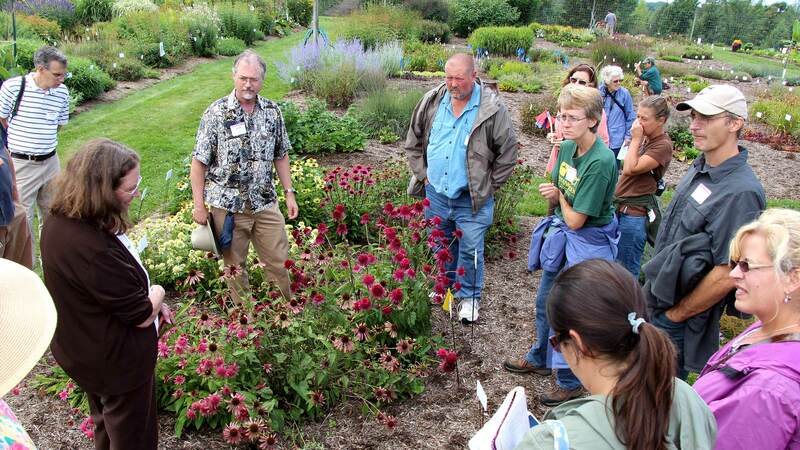 Armitage also demonstrated his new Greatest Perennials and Annuals app for the group. They also heard from Cornell plant pathologist Margery Daugherty on greenhouse diseases, Cornell horticulture professor Chris Wien on high tunnel cut flower production, and Peter Konjoian, Konjoian’s Floriculture Education Services, on making the switch to greenhouse vegetables from ornamentals. Donald Horowitz ’77, Wittendale’s Florist & Greenhouses, East Hampton, N.Y. took first place in the new Edibles Division in the 2015 Kathy Pufahl Memorial Container Design Competition. He also finished first in the Hanging Basket Division and third in the Open Division. In the afternoon at Bluegrass Lane, attendees got hands-on experience diagnosing pests and diseases, toured favorite perennials, and viewed trials of annual flowers and container growing media and demonstrations of containers combining edibles and ornamentals. The afternoon also featured the announcement of the winners of the twelfth annual Kathy Pufahl Memorial Container Design Competition. Pufahl, who founded Beds and Borders, Inc., Laurel, N.Y., was a staple on the horticultural educational seminar circuit, spreading her container ideas far and wide. It is her vision that changed the way the horticulture industry looks at the spring container business. Her influence brought back a bit of the art and beauty to the business. All proceeds from the contest — which has topped $10,000 since its inception — go directly to IBD research at Mt. Sinai Hospital, to help ensure a bright future for Kathy’s daughter and others like her, who have Crohn’s disease. For more information about the competition, contact: Karen Hall nysfi.org@gmail.com. 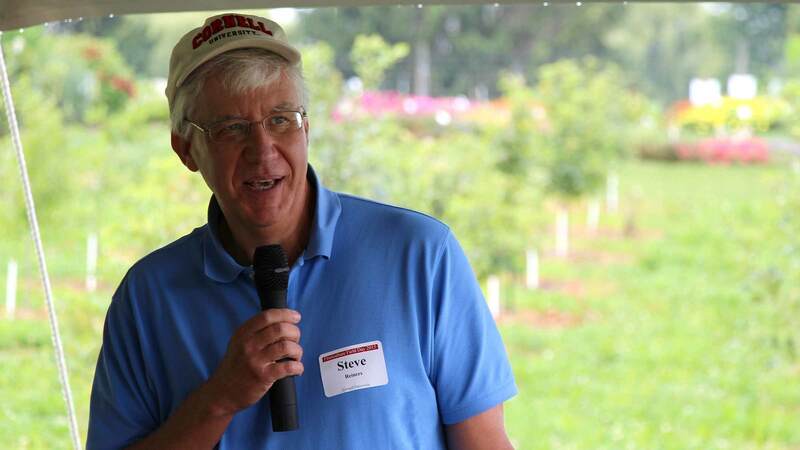 Horticulture chair Steve Reiners welcomes field day attendees to Bluegrass Lane. 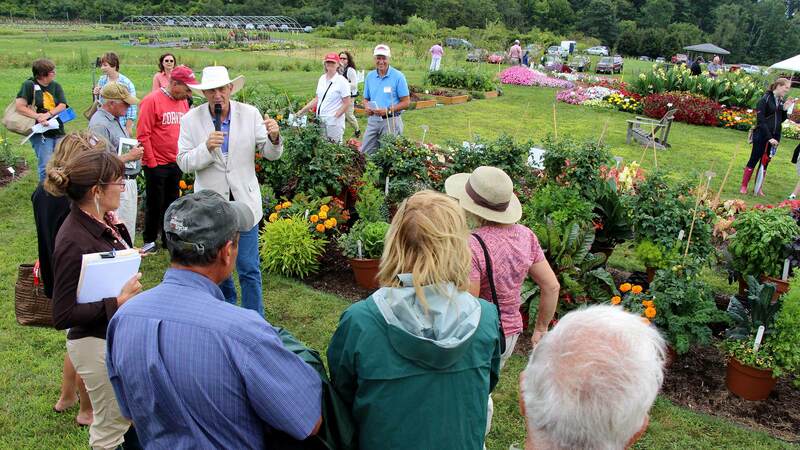 Attendees view demonstration of mixed vegetable/ornamental container plantings. “For many, the garden of the future will be on their deck,” Armitage told the group. Plant pathologist Margery Daugherty and entomologist John Sanderson help attendees identify insect pests and diseases on perennials at Bluegrass Lane. 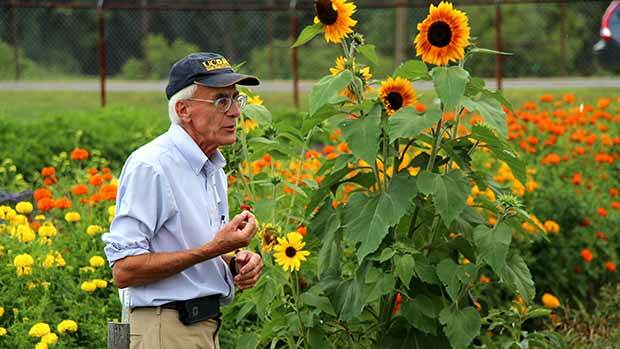 Horticulture professor Chris Wien explains his cut flower research at the Maple Avenue research facility. Students learn about vegetable production equipment at Cornell’s Thompson Research Farm in Freeville. Cornell University and Ithaca College will offer a new Master of Arts in Teaching (M.A.T.) program to help meet growing demand for qualified agricultural educators. Students in the graduate program will earn a degree in agriculture education from Ithaca College in collaboration with Cornell Connect, a program of the College of Agriculture and Life Sciences (CALS). 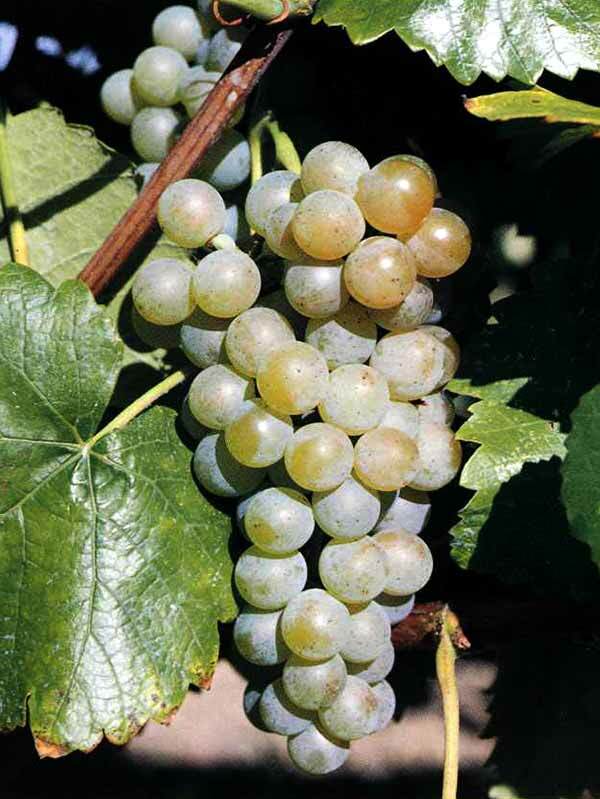 ‘Traminette’ – a mid-season white-wine grape released by Cornell’s grape breeding program in 1996 – was named the Outstanding Fruit Cultivar for 2015 by the American Society for Horticultural Science (ASHS) at its annual meeting in New Orleans August 7. ‘Traminette’ produces wine with pronounced varietal character likened to one of its parents, the vinifera cultivar ‘Gewürztraminer’, says Bruce Reisch, professor in the Horticulture Section of Cornell’s School of Integrative Plant Science, one of the breeders who developed the cultivar. In addition to producing superior wines, ‘Traminette’ yields well, has partial resistance to several fungal diseases, and is more cold-hardy than ‘Gewürztraminer’, Reisch adds. 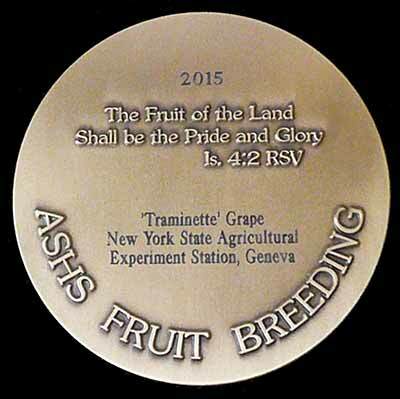 It is the fifth wine grape cultivar released by the New York State Agricultural Experiment Station (NYSAES). “Support from the wine industry was essential to the development of ‘Traminette’,” says Reisch. John Brahm of Arbor Hill Grapery and Herman Amberg of Grafted Grapevine Nursery planted large numbers of vines and produced experimental wines prior to the cultivar’s official release. “Arbor Hill was the first to market a varietal ‘Traminette’ wine the year it was released, and it’s been a successful product since,” Reisch notes. Wineries across the country have produced award-winning ‘Traminette’ wines, and the acreage continues to grow. ‘Traminette’ is grown on more than 100 acres in New York, as well as in Ohio and Virginia. Indiana grows about 75 acres and it’s the signature white wine variety of the state. Easley Winery’s 2014 Traminette was named the Wine of the Year at the 2015 Indy Wine Competition. 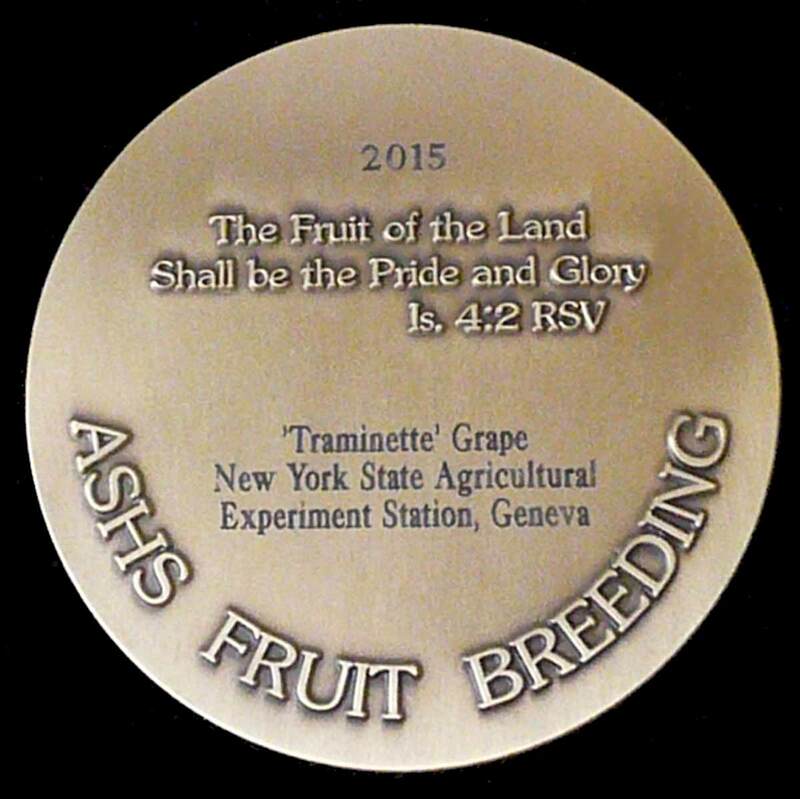 ‘Traminette’ is the fourth NYSAES-bred fruit cultivar honored by ASHS since the Outstanding Fruit Cultivar award’s inception in 1987. Others include ‘Empire’ apple (1987), ‘Jonagold’apple (1988), and ‘Heritage’ red raspberry (2004). 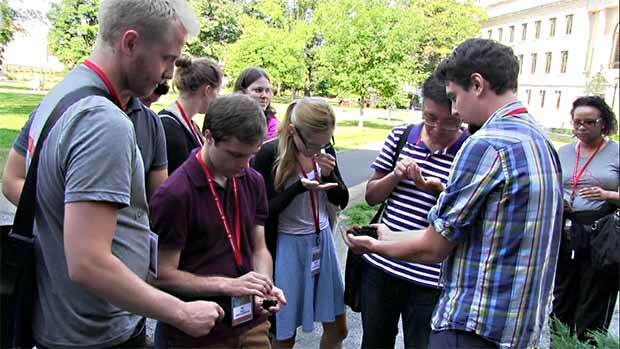 More than 50 government agency staff, conservationists, researchers, and students from around the world flocked to campus for the four-day Cornell Soil Health ‘Train-the-Trainer’ Workshop August 5 to 8. Attendees heard from a line-up of speakers on the latest in soil health testing and management, participated in hands-on workshops, put together mangaement plans, and visited Cornell’s Musgrave Research Farm in Aurora for field work and demonstrations. For more information about the Cornell Soil Health program, visit the Cornell Soil Health website. Horticulture graduate student Miles Schwartz Sax (right) and attendees examine healthy urban soil from a planting outside Mann Library that was certified by the Sustainable Sites Initiative, the equivalent of LEED certification for landscapes.